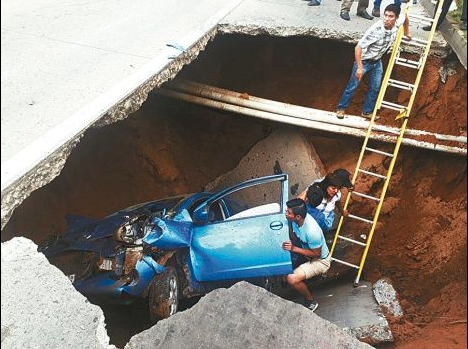 Meanwhile, two women have narrowly escaped death after their car plunged into an enormous sinkhole in Santa Cruz, Bolivia’s largest city. The incident happened early in the morning on a major thoroughfare as the asphalt suddenly gave way beneath the passing vehicle. Firefighters pulled the two women, aged 47 and 49, from their car and they were taken to a hospital with non-life-threatening injuries. A leaking water main undetectable from the surface weakened the ground beneath the street, municipal Public Works Secretary Freddy Arauco told reporters. Bolivian Thoughts opinion: Couldn’t it be possible to install pressure check points throughout the water system? So, that appropriate maintenance can prevent this from happening again?